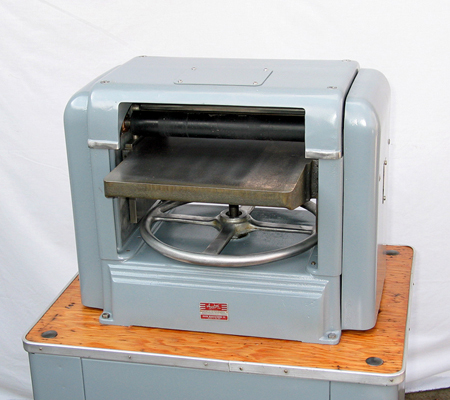 K-Line K2100 12-3/4” x 4” planer originally manufactured around 1948. 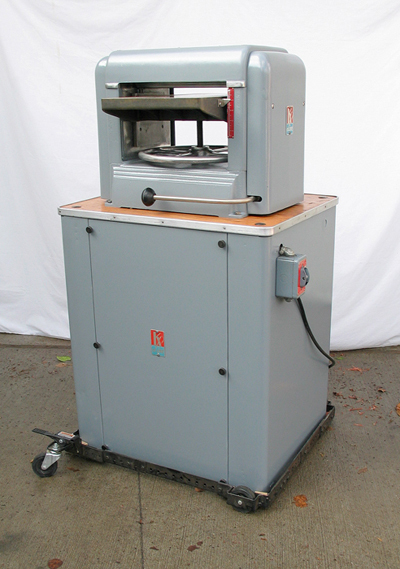 The entire casting of the K2100 is aluminum along with a 12-3/4” x 20” cast iron table. Even with that much aluminum and without the sheet metal stand and motor, the planer alone weighs 170 pounds. 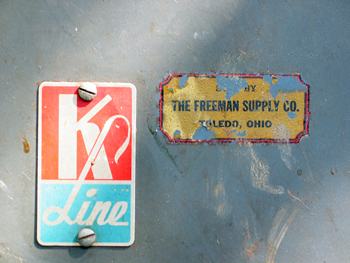 This K2100, serial number 6999, was made by Kneisley Electric Company, rebadged as Foster Manufacturing and sold by Freeman Supply. Photos of the table guide plates used in the K2100 and changed in the next 12" K-Line model, the K2200. These are the guide plates that Tom Kneisley said were difficult to adjust and keep in adjustment. Each of the 2 - 6" x 6" plates are held in place by 4 bolts that need to be loosened in order to tighten or loosen the 6 adjusting set screws. The “in-out” process is a pain. 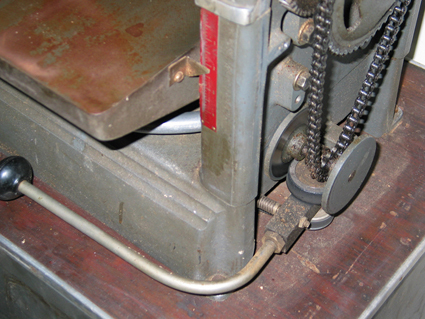 The second picture shows the steel gib used to prevent or correct any wear on the guide plates. They are adjusted by 3 set screws and locked in place by 3 more set screws. 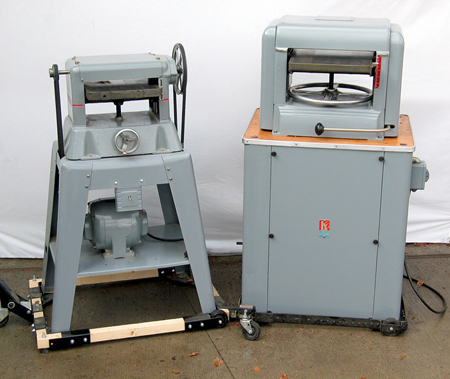 The 1953 model K2200 (right) was redesigned to use 2 table guide pins similar to the Yager/K2000 10” planers, needing no adjustment. 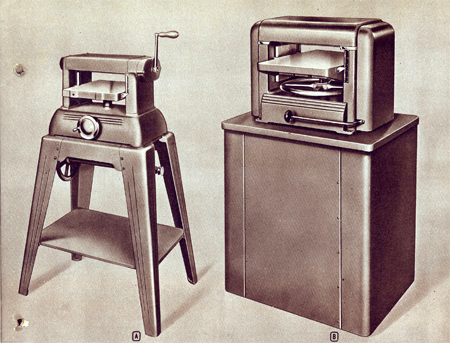 The feed and cutterhead assembly. 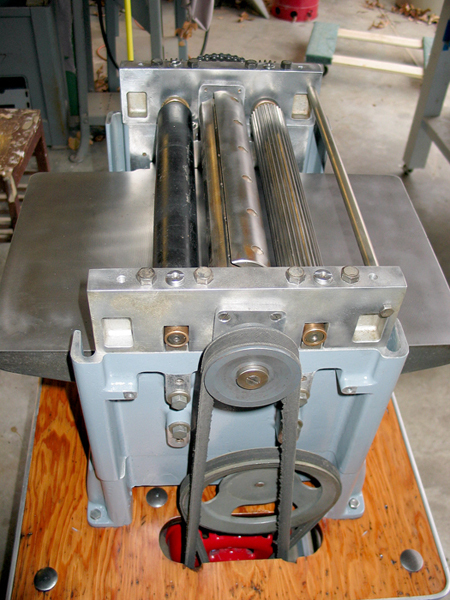 The 3 knife cutterhead uses 2 WC88504 bearings in the aluminum castings. Each knife is stamped “K-2504". 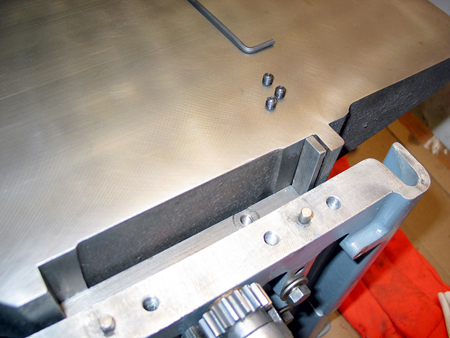 Knurled in-feed and neoprene out-feed rollers use bronze flange bearings. The out-feed roller will need re-coating. 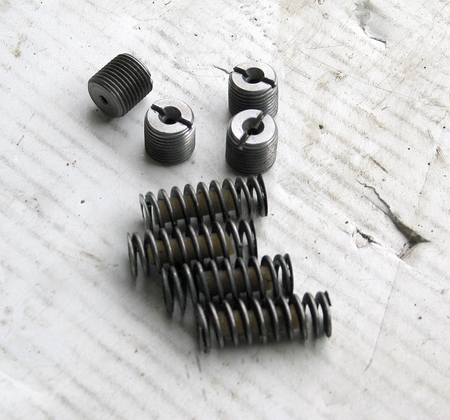 These are feed roller compression springs and screws with oil soaked felt wicks. 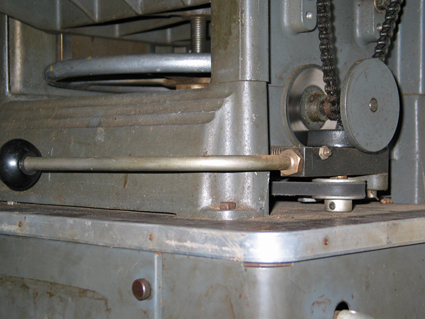 Adjusting the screws increases or reduces the roller tension. View from cutterhead pulley. 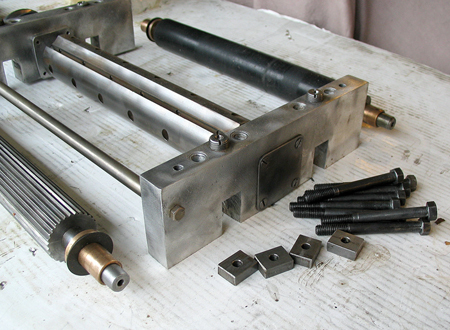 Aluminum casting with feed assembly attached with 8 bolts. Gears are cast iron. 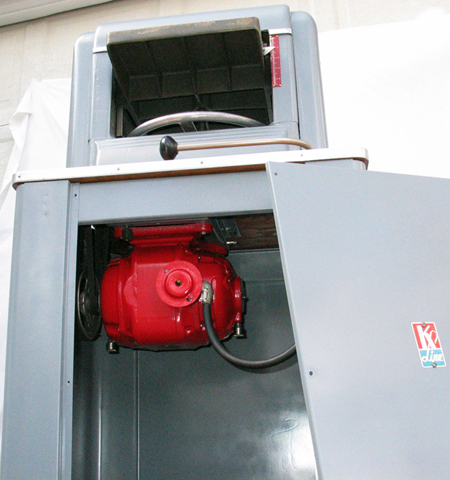 The K2100 has a power “automatic table adjustment device”. 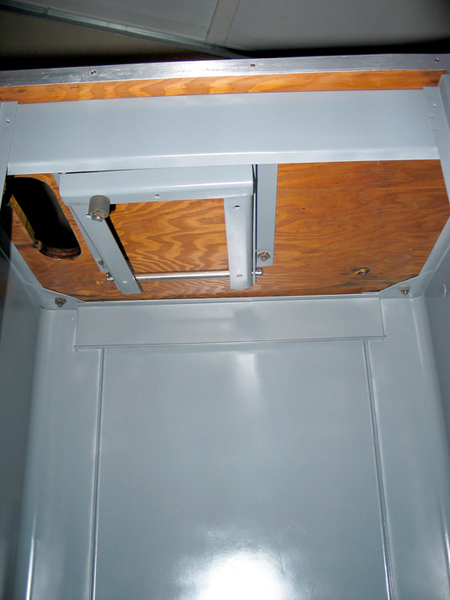 By engaging the clutch the single adjusting screw raises or lowers the table. Final adjusting can be done by hand adjusting the 14” center wheel. 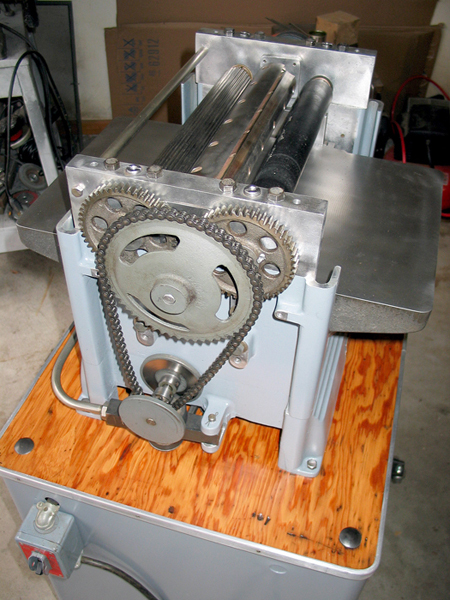 Although a 1-1/2 to 2 hp motor was recommended, this planer has a 1 hp 1725 rpm Baldor repulsion motor hinged below a wood table in the cabinet base. 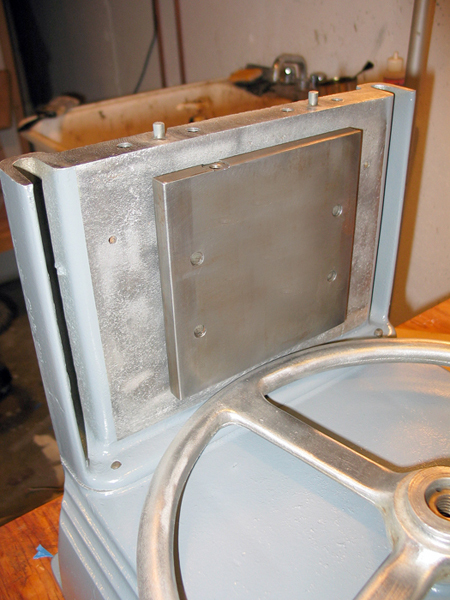 A 6” pulley from the motor to a 3” pulley drives the cutterhead at 3600 rpm. 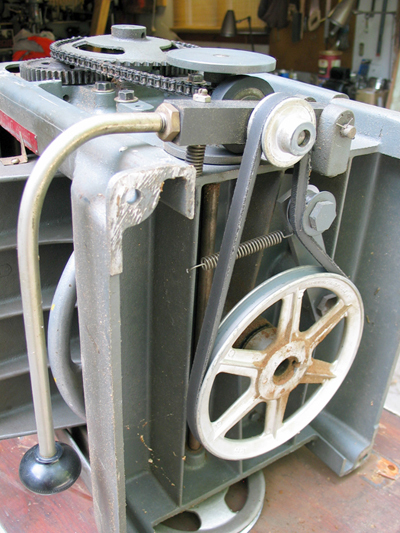 A 1-1/2” pulley mounted on the motor shaft to a 7” pulley drives the feed rollers.